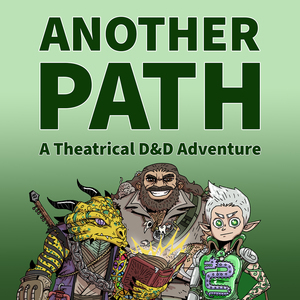 We found 10 episodes of Another Path with the tag “d&d”. The Aegis Three meet some familiar faces. Familiar to us, at least. The Aegis Three take a few moments to themselves. The Aegis Three have dinner with the King of Bulwark. The Birds finish their first flight with a fantastic show of force. Mordecai has a long awaited discussion, Zafiir and Jackson get dressed, and all three of them have an uncomfortable discussion. The Aegis Three leave the shadow of Everburn for the shadow of Bulwark. The Aegis Three get to the literal and figurative bottom of the mystery of Everburn Hall. The boys go up to figure out what went down at Everburn Hall. The Aegis Three and Jeremiah take to the stage in a one scene spectacular! Training kicks in and tensions flare within the walls of Everburn Hall.